New York, NY (October 22nd, 2015) – The Institute for Family Health and the High School of Fashion Industries co-hosted a ribbon-cutting ceremony for the Falcon Health Center, a new school-based health center serving Fashion’s 1,800 students. The health center is the result of the combined efforts of the high school, led by Principal Daryl Blank; the New York City Departments of Education and Health; the New York City School Construction Authority; the New York State Department of Health; and the Institute for Family Health, a not-for-profit community health center which provides medical care, mental health and soon, dental care at the site. 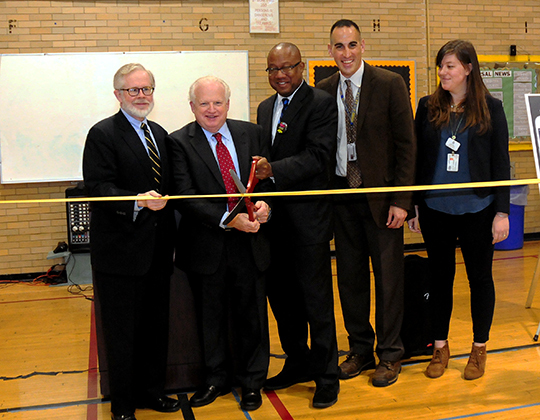 About 75 city and school officials, parents, students and health center staff attended the ceremonial ribbon-cutting. The Falcon Health Center was a part of Chancellor Walcott’s 2013 SBHC Initiative to fund the building of 20 new SBHCs in NYC. It is one of 142 SBHCs serving over 339 schools in the five boroughs of NYC. New York State DOH oversees the SBHC program and provides grant funding to the provider organizations to cover some of their expenses. For the Institute and other school-based health center operators, the grant is typically not enough to fully fund the cost of providing confidential, comprehensive services to students. The Falcon Health Center is one of three school-based health centers operated by the Institute for Family Health, serving nine schools. Together, the sites provide over 10,000 health care visits to children and teens annually. Services include medical care (physicals, vaccines, care for chronic issues like asthma/diabetes, reproductive health care, and care for illnesses and injuries in school); mental health services (both for crises and ongoing needs); health education for individual students and in the classroom; and insurance enrollment for students and their families. The school based health centers act as the primary care provider for students who do not have one, or coordinate with students’ usual source of primary care. The centers also connect students’ families to neighborhood health centers where they can receive care, regardless of ability to pay.